Will These 6 Wide Receivers Be on Your Draft Pick List? Dez Bryant was a stud WR three straight years before injuries derailed his past two seasons and left owners doubting his status. We know what a healthy season from Bryant looks like. He catches 85 to 95 balls and floats around 15.0 YPC with an excellent 14.5 career TD%. Bryant can go silent for stretches but then have three catches on one drive and score an entire game’s worth of points. His catch rate dropped last year as he struggled with injuries and adjusted to Dak Prescott, but he enters 2017 healthy for the first time in three years after spring holdouts and surgeries hurt his past two offseasons. 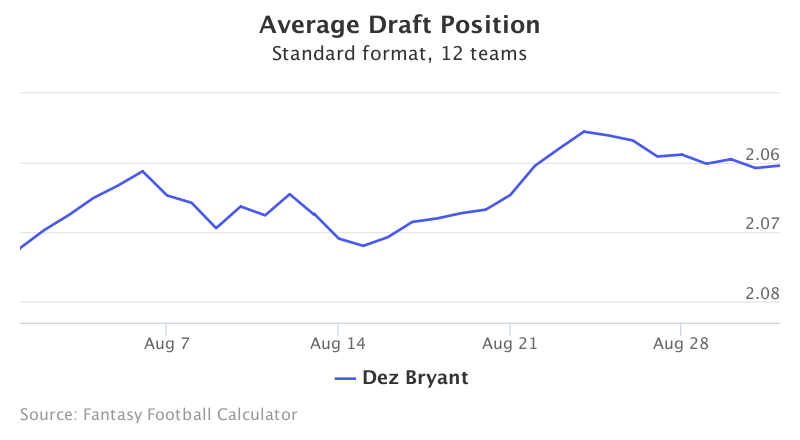 A healthy Bryant is a stud, and the absence of Ezekiel Elliott could make him a big target early. 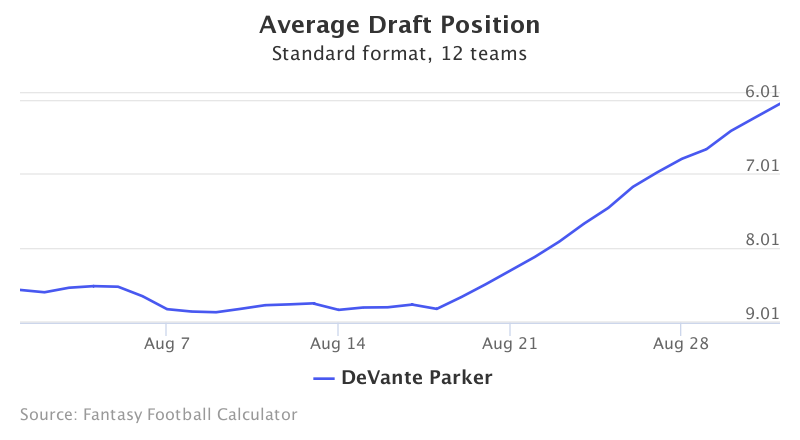 Devante Parker has become one of the buzz guys this August with his ADP increasing almost two full rounds in the last two weeks already. The buzz is worth it for Parker, a sleeper the public is waking up to just in time. 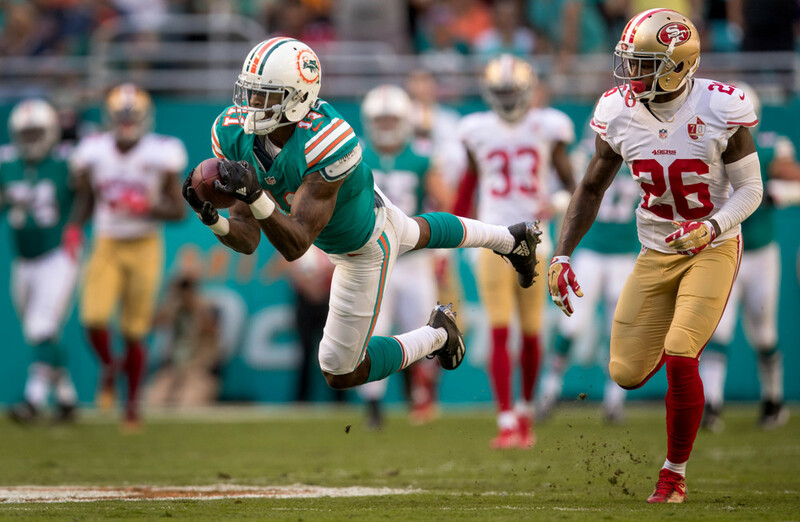 Jarvis Landry has been the WR1 in Miami for years, but new QB Jay Cutler has always preferred throwing to tall lanky targets that can stretch the field and Parker is the only Dolphin that fits that profile. Parker fits the profile of Alshon Jeffery and Brandon Marshall as past Cutler WRs that saw 120+ targets with a nice YPC and plenty of TD opportunities. Parker could very well be this year’s surprise top ten WR. 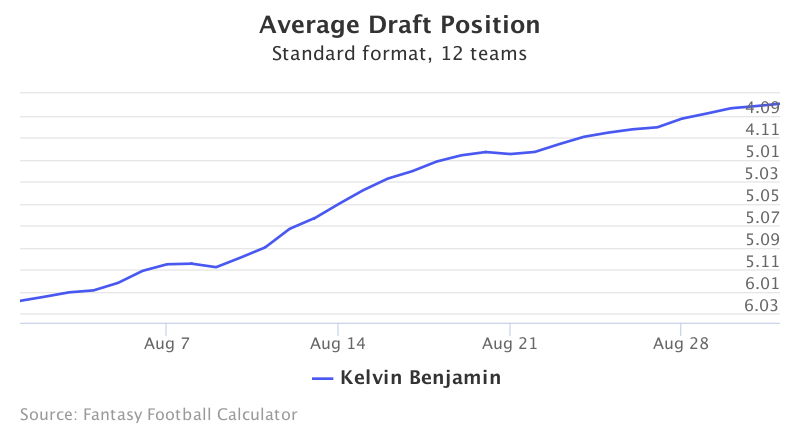 Is Kelvin Benjamin a great target or a fantasy disappointment? Drafters seems split, with his price barely inside the top 50. Benjamin followed up his huge rookie season by missing all of 2015 with a torn ACL, then started off hot with three TDs the first two weeks last year before finishing with seven as his targets fell off. But don’t underestimate how much Cam Newton’s injuries hurt Benjamin’s value last season. Carolina gets a last place schedule this year, one of the league’s softest, and they’ve added a lot of offensive firepower and should be in the redzone a lot where Benjamin shines. He’s being taken at WR22 and has finished in the top 18 WRs both healthy seasons. He should do so again easily. Larry Fitzgerald is Old Faithful among WRs, yet he continues to slip in drafts every year. Despite his consistent production, he’s available in the 6th round. Fitz has played 10 healthy seasons since his rookie year. He’s been a top 18 WR in all but one, as sure and steady a WR2 as they come. He mostly catches short underneath routes now and no longer has top five upside but doesn’t need to in the 6th round. 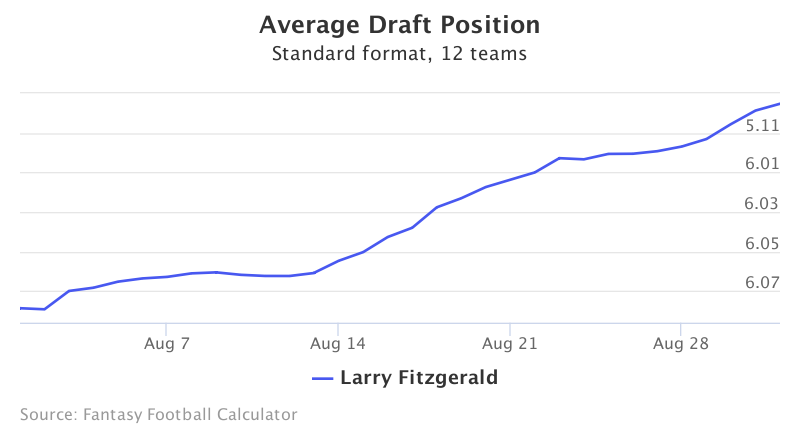 Fitzgerald had 100+ catches the past two seasons and should do so again. Unless he gets injured, he’s a mortal lock to outperform WR27 where he’s being taken and would be drafted a full two rounds earlier if we weren’t so in love with new flashy things. 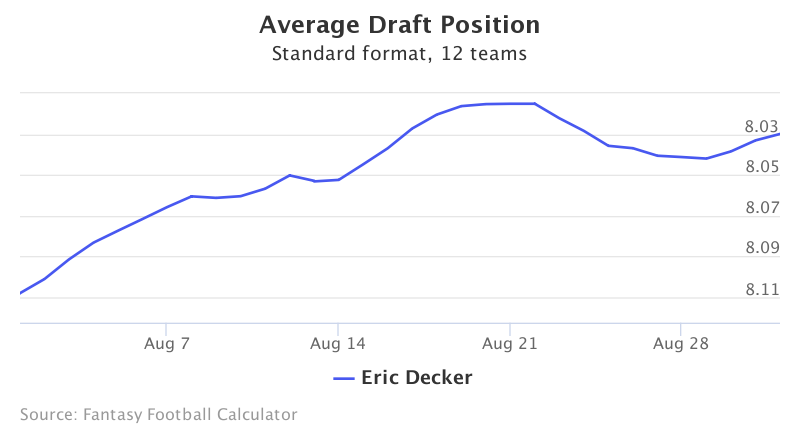 Eric Decker is a forgotten man in drafts. Despite finishing as a top 12 WR in three of the past five seasons, he’s falling all the way to the 8th round. The Titans loaded up at WR, drafting Corey Davis among the top five picks and then adding Decker in free agency. Decker missed all but three games last season with a torn rotator cuff but has otherwise remained healthy and consistent in his career. He tends to put up around 80 catches and clear 1000 yards with ease, but the real value is his TDs where Decker uses his large frame to keep an impressive 13.5% TD rate. That could mean double digit TDs for an improving offense with one of the league’s easiest schedules. Decker should at least finish WR36 where he’s being drafted but could end up in the top 12 again if he becomes Marcus Mariota’s go-to guy. Keenan Allen’s injuries woes have cost him 72% of the last two regular seasons but he’s so good when he’s on the field that he’s still a 3rd round pick. Allen has been a target monster, with 10+ targets in half of his past 20 games, and his insane 76% catch rate means he’s grabbing seven or more passes many games. That stretch paces Allen to a 110-catch season as Philip Rivers’s favorite target, along with around 1150 yards and eight TDs. The problem with Allen is the injuries. But he comes into 2017 healthy and the injuries he’s sustained (bruised kidney, broken clavicle, torn ACL) are fluky, not the type to flare up again. 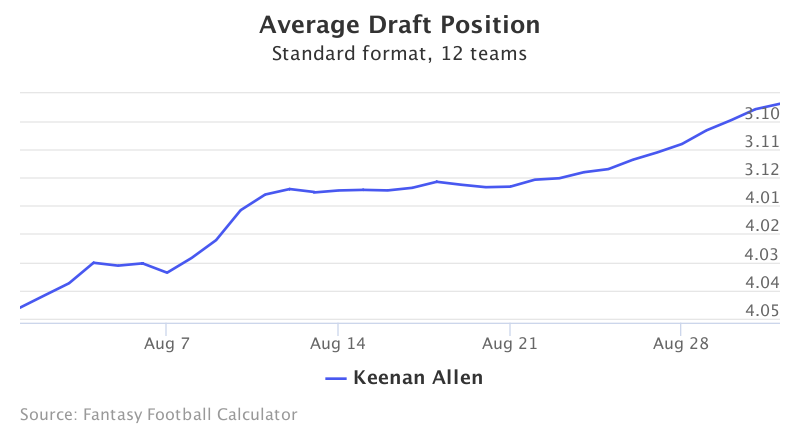 Allen looks like an excellent WR2 with potential for even more in PPR leagues.